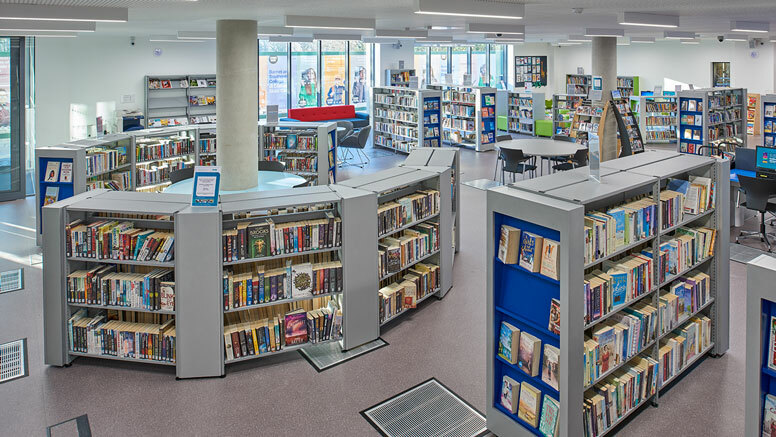 The London Borough of Barnet’s Colindale Public Library was recently co-located with Barnet and Southgate College in new premises. A similar scheme is nearing completion for the Borough’s Church End Library. Demco Interiors worked with contractor Capita and the library team on the library design and installation of the interior of the brand new library. This space shouted out for a bright modern interior, and Demco’s Mode four post shelving system set the standard with its open, less-but-more structure. Single and double sided Mode shelving bays with painted and display end panels snake through the centre of the library creating zones and areas and a ‘what’s around the corner’ curiosity. Soft and casual seating was bang on trend with a mix of funky sofas, tub and cool operator chairs. Shades of colour from neutral cool greys, degrees of blue, offset against deeper gunmetal and charcoal grey colour palette look smart and urban. A pop of red bursts out occasionally with cool bright red rocker chairs in the Teen Area, with the bright red upholstery backing on to the charcoal sofas. Adult IT desking in pale grey with ocean blue worktops is complete with the lovely detailing of bright blue edges streaming down the vertical edges. The children’s library is a mini version of the adults section but with added pops of colour to make the area playful and fun. Bright green is added between bay seating, stools and mini IT workstations. Citrus colours of tangy green and canary yellow workstations look fresh and inviting.